Game budgets have ballooned in recent years, as this list of the most expensive game budgets proves. Game publishers rarely disclose the exact amount of money that they put out to make the games that we love to play. This information is either pieced together from reports from developers or sometimes mentioned during investor conference calls. Because the cost is directly related to the amount of man-hours poured into making the game, the length of development time usually adds to the overall cost. That means that some of the games on the list are there because of delays or setbacks, but most of them are just really huge games. Here's the list of the top 10 most expensive games to make, according to Digital Battle. Some of these games haven't been released yet, so it's entirely possible that their budgets could grow even higher. Also, it appears that cancelled games are not considered (I'm looking at you, Duke Nukem Forever). The sad truth is that a huge budget doesn't always seem to translate into quality games. Most people would agree that Halo 3 wasn't as good as its less expensive predecessors and that Too Human ultimately wasn't worth the expensive 11th hour switch from the Unreal 3 engine. Also, a game's "size" seems to make for more expensive games. Shenmue boasted a huge world that cost a lot to craft, especially since its the only game on this list from the previous console generation, and the cutscenes in Metal Gear Solid 4 alone probably cost as much as it did to make most complete AAA games. 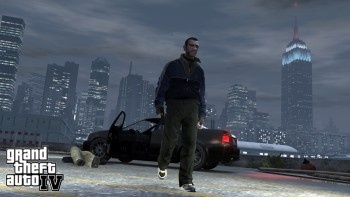 Grand Theft Auto IV cost a boatload of money to make but that's because Rockstar had over 1,000 people working on the game for over 3 years. Not to mention the huge amount of licensed music. As for the games that haven't yet been released, we'll wait to pass judgement on them. But they have some serious expectations to live up to.